Motorola’s Moto Z Droid and the Moto Z Force Droid have only been available for about a month, but there’s already a new addition: the Moto Z Play Droid. 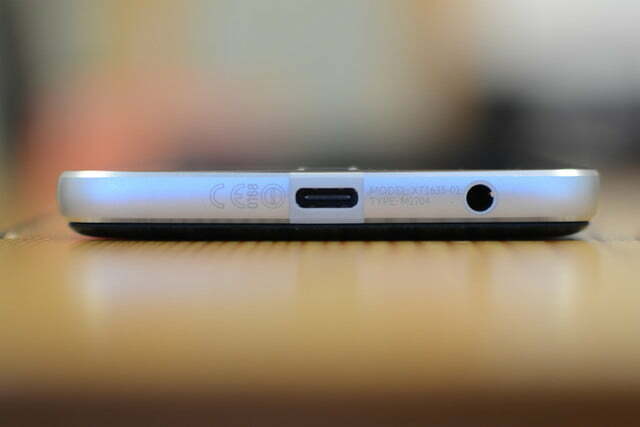 There’s a reason to be excited for the latest family member — it comes with a 3.5mm headphone jack. If you’re a Motorola fan interested in Moto Mods but can’t live without a 3.5mm headphone jack, the Moto Z Play Droid is the smartphone for you. Before we dive in, let’s get the names right. 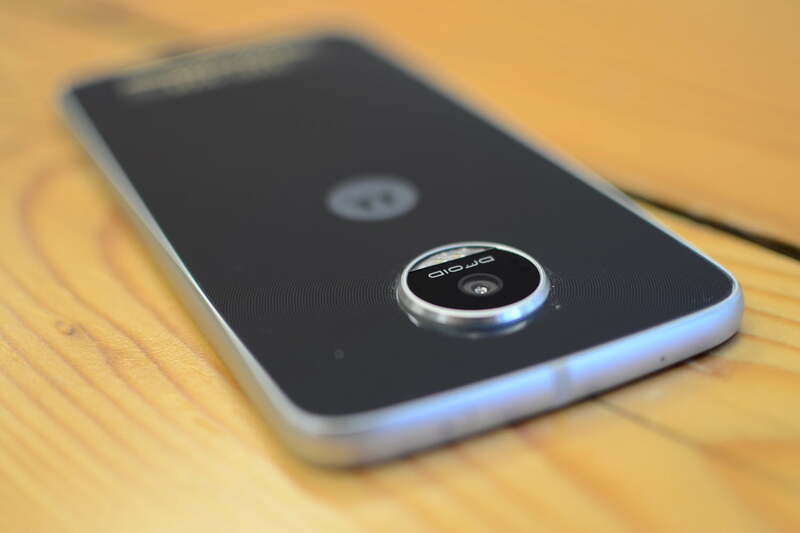 The Moto Z Force Droid is a U.S. only device, but the Moto Z Droid and the Moto Z Play Droid will have an international GSM unlocked variant — remove the Verizon-exclusive “Droid” branding, and that will leave you with the Moto Z and the Moto Z Play. You can read our review of the Moto Z Droid and the Moto Z Force Droid here. 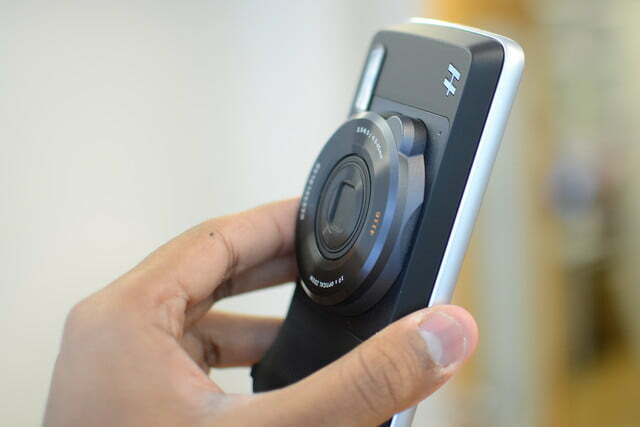 The Lenovo-owned company also announced a new Moto Mod to pair with all three devices — the Hasselblad True Zoom camera. 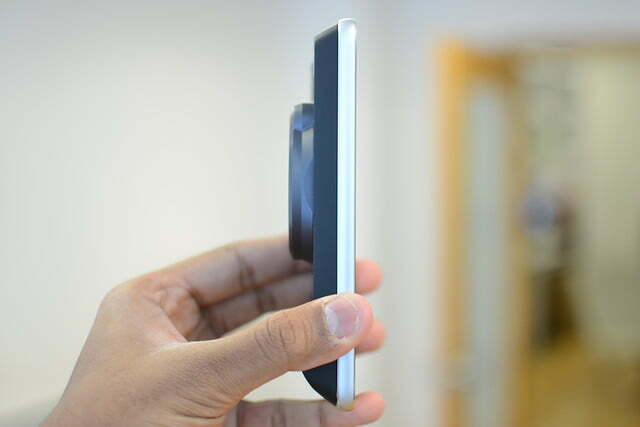 It magnetically snaps onto the back of the phone, like all mods. Unlike the Moto Z and the Moto Z Force, the Moto Z Play is powered by Qualcomm’s Snapdragon 625, not the 820 seen in most flagships this year. The processor downgrade is also paired with 3GB of RAM, 1GB less than the Play’s older brothers. Similarly, there’s only a 32GB storage option for the Play in the U.S. and most of the world. China will get a 64GB variant. Thankfully, it has MicroSD support so you can add 2TB of additional storage. It’s hard to find any faults with the smartphone’s performance. The thing just flies. We’ve only had a brief time with the Moto Z Play, but it’s hard to find any faults with the smartphone’s performance. The thing just flies. Apps open and load quickly; there’s no stutter or lag when moving through home screens or when opening the app drawer; and the device rarely gets hot. We played a few games for well over 30 minutes and the Moto Z Play only got a little warm. We also didn’t experience any performance issues in gameplay, and that’s thanks to the Adreno 530 GPU — the same in the Moto Z Force and Moto Z, and other flagships like the LG G5. It’s refreshing to see another device running close to stock Android — the Moto Z Play runs Android 6.0.1 Marshmallow, and we can expect it to receive Android 7.0 Nougat as well, since Motorola said the Moto Z and the Moto Z Force will get it. Unlike most phones, there’s no additional skin or theme bogging down the Android OS, just a few additional settings in the Settings menu, such as Moto Mods. Of course, all Verizon-exclusive smartphone come with a hefty share of bloatware. We counted more than 15 carrier-added apps, and few can be uninstalled. Motorola’s proprietary features are also complementary to Nougat: Moto Display is more refined than ever, and Moto Actions offer consistent and useful gestures. 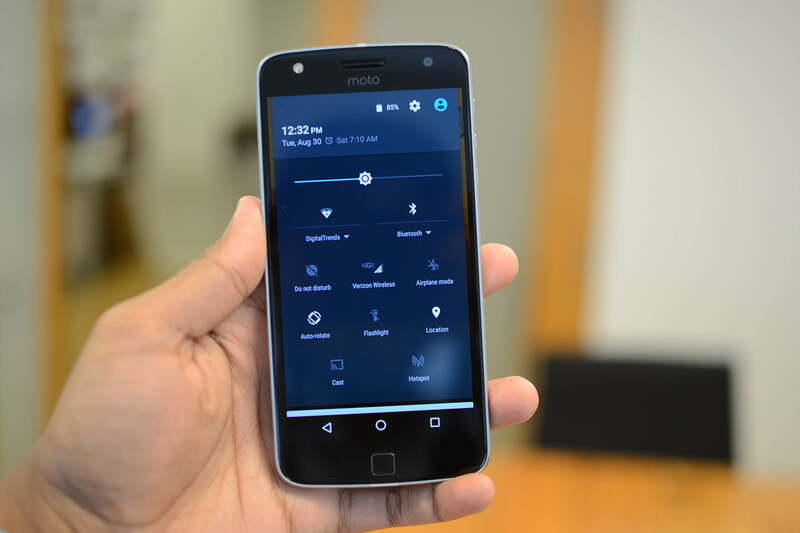 We haven’t had a chance to try Moto Voice yet. Still, we have yet to feel held back by the device’s performance, We’ll have to keep testing the device for a longer period of time to form a final verdict. The 5.5-inch Super AMOLED Moto Z Play has a resolution of 1,920 x 1,080 pixels, meaning while it matches the size, it doesn’t match the Quad HD resolution on its more powerful brothers. 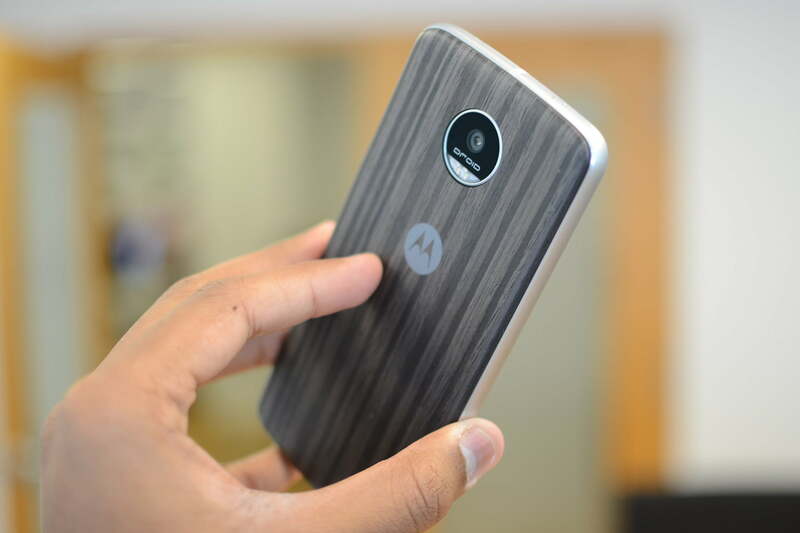 Its dimensions and weight are also slightly larger than the Moto Z Force, but only marginally. Price is really what’s going to make or break the Moto Z Play. But when you put all three devices next to each other, the differences are easily recognizable. 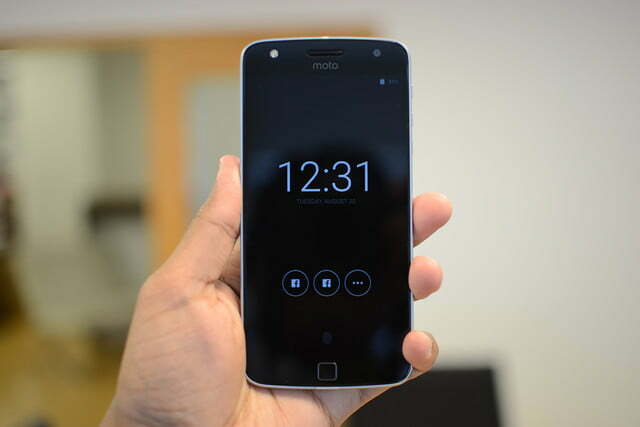 The front camera and flash switched places on the Play, and the Moto logo is now at the top of the screen. On the back, rounded lines emanate from the rear camera, unlike the horizontal lines found on the Moto Z and Moto Z Force. The Moto Z Play looks very industrial, and while that’s not a bad thing, it can easily be masked with the Style Shell Mod that comes with it. Ours was wood and also got rid of the camera bump on the back. But if there’s one thing to complain about in terms of design, it’s the button placement. The volume rocker separates the up and down button, and right below is the power button — they all have equal spaces. Sure, the power button is ridged, but it’s still not easy to quickly figure out which button you’re pressing without looking at it. 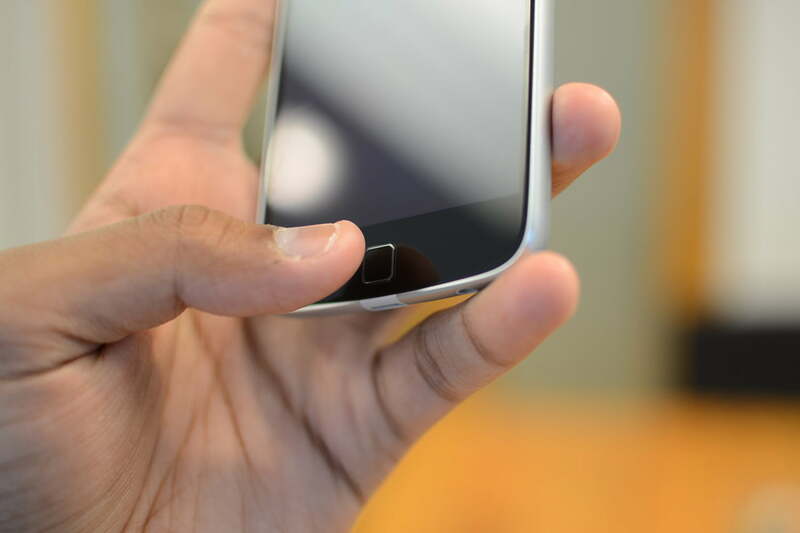 The front button is awkward as its purpose doubles as a fingerprint sensor and a power button. You can’t physically press it, but it feels like Home button. It’s incredibly aggravating when you press it expecting to return to the home screen, but your screen just turns off instead. Without the wood back, the Moto Z Play feels fragile. 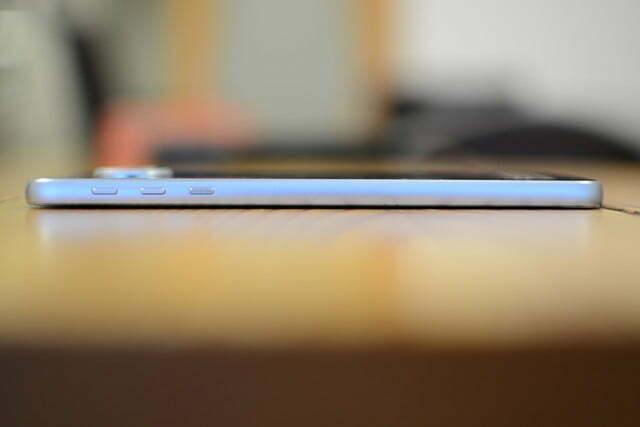 It also is quite light and thin, but once you add the Style Shell Mod, it feels like a completely different device. It’s noticeably heavier, smoother, and bulkier. Still, you may want to leave it on. We haven’t dropped the device, but we’re already seeing scratches and scuff marks on the front and back glass. 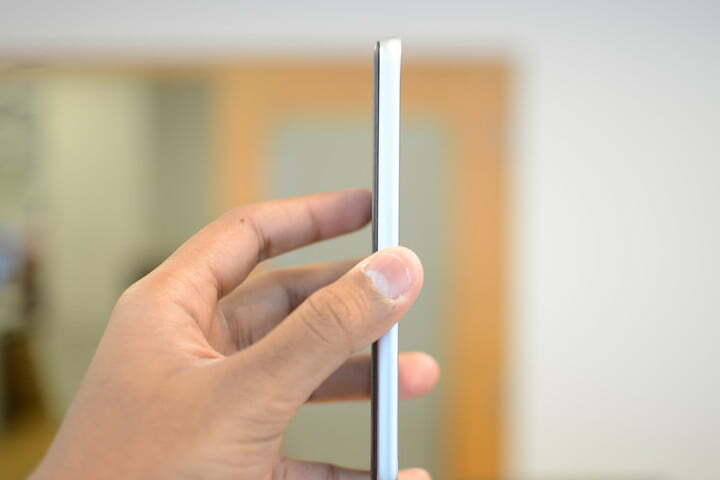 The Play is also a dust and fingerprint magnet, so keep a micro fiber handy, too. Motorola says the Moto Z Play display uses Corning’s Gorilla Glass, but we’ll have to keep testing it to see if it is still susceptible to a lot of scratches. The rear camera has 16 megapixels, but the front has the same 5-megapixel wide field of view as the Moto Z and Moto Z Force. Motorola’s twist gesture launches the camera incredibly fast on the Play, and photos are snapped quickly. It did take some time focusing on specific objects, but overall the pictures are good. There’s nothing spectacular here, and while the white balance did okay, the picture quality at times isn’t the sharpest. That’s not to say the camera is bad; it takes solid shots and even offers a manual mode. It seems the problem usually stems whenever there’s slight movement, and when lighting conditions aren’t optimal. That seems to affect most phones these days, but we’ll continue testing to see how the camera fares. Interestingly, the Moto Z Play actually has a bigger battery than the Moto Z and the Moto Z Force, but it’s hardly an improvement. The Moto Z Force has a 3,500mAh battery, and the Moto Z Play offers 3,510mAh. You won’t notice a difference with the additional 10mAh. Regardless, battery life is pretty good so far. We can’t provide any concrete times yet, but after medium to heavy use, our device ended the day at around 30 percent. Check out our final thoughts in the upcoming review. 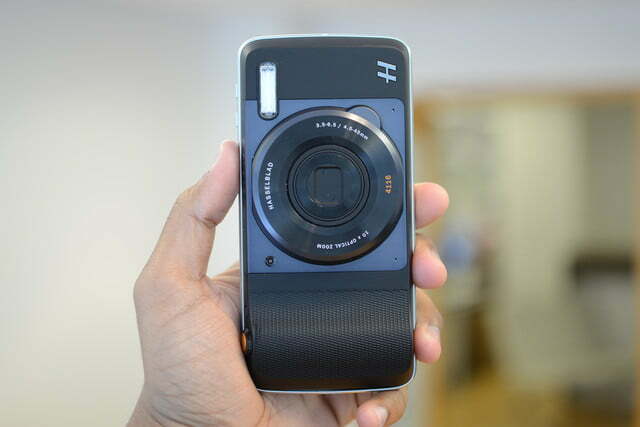 Hasselblad’s mod for the Moto Z lineup is cool. Just snap it on to the back and you have a camera with 10x optical zoom. It’s incredibly bulky once you snap the Play and the mod together, and it’s likely why Motorola includes a carrying case with a strap — it’s much better than stuffing the phone in your pocket. Like the Moto Z series, the mod looks industrial. It acts as a camera grip, offers a dedicated camera launch button, a zoom toggle, and a shutter button, and a useful flash. There are many caveats, though. Launching the camera takes about three to four seconds — slower than the twist gesture – and the camera also doesn’t take pictures quickly, meaning moving objects can be a little blurry if you’re not in the right lighting conditions. There’s a lot of noise in images, but we need to do a little more testing to see if it’s only due to poor lighting conditions. The zoom does provide excellent opportunities for good shots, and the flash is actually useful as opposed to what’s built into the Moto Z Play. If you’re serious about photography, the mod also enables the option to shoot in RAW format — the setting isn’t available when you take the mod off. There’s a handy set of manual controls, and we plan to thoroughly test the mod to see whether it’s worth the price. Both the Moto Z Play and the Hasselblad True Zoom fall under Motorola’s Limited Warranty — that means the products are covered for 12 months after the date of purchase. A Motorola spokesperson has confirmed with Digital Trends that the Limited Warranty “covers only the Moto Insta-Share Projector and Hasselblad True Zoom Moto Mods.” Other third-party Moto Mods are not covered by this warranty, but they may have a separate warranty. The Moto Z Play Droid is now available for purchase on Motorola’s website and through Verizon for $408. You can opt for Verizon’s device payment plan, and that would cost $17 per month for 24 months. The unlocked GSM variant, the Moto Z Play, will be available for pre-order on Sept. 15 for $450, but availability will only begin in October. 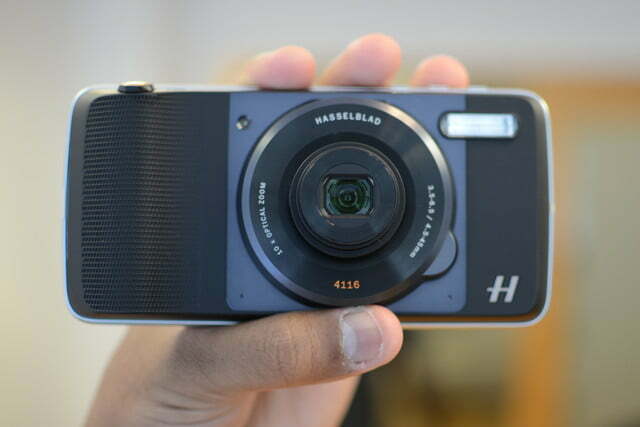 The Hasselblad mod costs $250 from Verizon, but $300 from Motorola. Pre-orders are now open, and it will be available on Sept. 15. Verizon is offering a limited time buy one get another 50 percent off promotion for the Moto Mods. The 50 percent discount only applies to a mod of equal or lesser value. We have liked what we have seen so far with the Moto Z Play Droid and the Hasselblad True Zoom. Since the Play is meant to be the lower-end device, it does have a lower cost at $408 ($450 for unlocked) — but the market is so rich with great devices at similar prices like the OnePlus 3, ZTE’s Axon 7, and Huawei’s Honor 8. The former two devices run Qualcomm’s flagship processor — the Snapdragon 820, and the Moto Z Play Droid uses the slightly lower-tiered Snapdragon 625. And then there’s the Moto Mods — it’s what makes the Moto Z line unique, but it’s also what keeps people from buying into the idea of mods. They’re too expensive for what you get, and buying more than one can certainly break anyone’s bank. 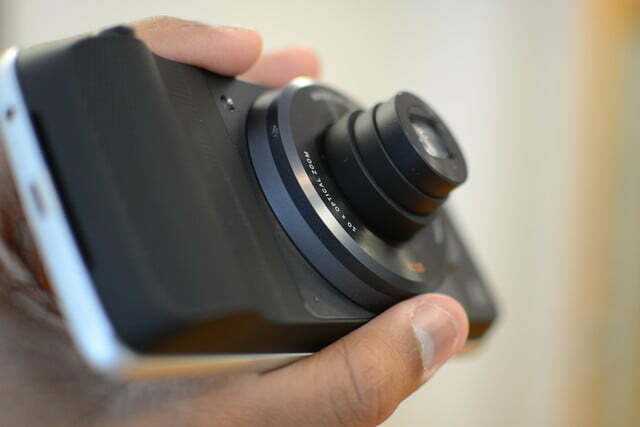 We’ll have to test around with the Play Droid and the mods, including Hasselblad’s True Zoom, even further to see if it really is worth the nearly $750 price tag combined. Expect our full review in the coming weeks. Article originally published on August 31. Updated on 09-08-2016 by Julian Chokkattu: Added news about the Moto Z Play and Hasselblad True Zoom availability.